Vitamin D – a potential cog in the complex machinery of hair loss, in which everything from biology to nutrition to lifestyle can play a part – is being reassessed by experts who now think that one form of the vitamin is much more important than the other. Until recently, vitamin D’s two forms (D2 and D3) were perceived as being equally beneficial. However, new research from the University of Surrey has lead doctors to come to the conclusion that vitamin D3 is twice as important to overall health than vitamin D2. Public Health England, an agency of the UK Government’s Department of Health, keeps a watchful eye on such matters as vitamin consumption. It has previously stated that around 20% of people in the UK have low levels of vitamin D.
To arrive at their conclusions about the different types of vitamin D, the University of Surrey researchers studied 335 South Asian and white European women during the winter months when levels of vitamin D are at an annual low in the body. Splitting them into five groups, they gave some a placebo, others a juice containing vitamin D2 or D3 and others a biscuit containing vitamin D2 or D3. The team’s findings showed that vitamin D3 was twice as effective at boosting levels of the vitamin than the D2 was. Whether the D3 was ingested via juice or biscuit, the results were largely the same. So what has all this got to do with hair loss? Potentially quite a lot – for example one study in Turkey recently found that 91% of people who were being treated for Alopecia Areata, the autoimmune disorder which leads to sudden, patchy hair loss, also had low levels of vitamin D. Frustratingly, the link between vitamin D and the human hair growth cycle is somewhat unclear – and it may not be just Alopecia Areata that it plays a role in. At Belgravia, hair loss specialists have also noted that vitamin D deficiencies are sometimes seen in clients presenting with thinning hair concerns. When there are dietary imbalances – whether this is in relation to vitamin D or other vitamins or minerals such as iron or zinc – a temporary hair loss condition called Telogen Effluvium can be triggered. This is most commonly seen in women and causes diffuse shedding from the whole scalp. Although it can appear to cause sudden and intense hair fall, the condition is actually activated around three months before hair loss becomes noticeable. 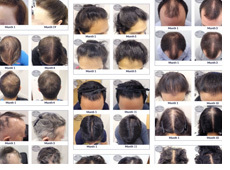 Researchers in Egypt recently looked into the part that vitamin D may play in androgenetic alopecia – male pattern baldness and female pattern hair loss. Despite the cause being genetics, there are a number of external factors which can influence the onset of the condition and the rate of shedding. Presently genetic hair loss treatment courses typically include suitable MHRA-licensed and FDA-approved products. Both men and women can make use of topical applications of high-strength minoxidil, a dose-dependent medication which is available in a number of formulations. The appropriate solution is applied topically to the scalp where needed, either once or twice per day, as directed. This is understood to open up potassium channels, improving localised circulation and actively encouraging hair regrowth as a result. Men who are aged 18 or over and deemed medically suitable, may also have the option of taking the one-a-day tablet finasteride 1mg. This helps to inhibit the production of dihydrotestosterone, commonly referred to as DHT. This hormone is vital for the development of sexual characteristics, including bodily hair during puberty, but is largely useless after this time. When men or women have a genetically predisposed sensitivity to DHT, follicles located along the top of the scalp and hairline are gradually weakened and thinning hair ensues. This process, known as follicular miniaturisation, can lead to baldness in men and advanced hair thinning in women, if left unchecked. Both men and women can further complement their hairloss treatment programmes with hair growth supporting products. These include home-use of the FDA-cleared low-level laser therapy (LLLT) device, the HairMax LaserComb, which stimulates the scalp to encourage regrowth. Another popular addition is food supplements, such as Belgravia’s exclusive Hair Vitalics hair supplement, which was developed using quality ingredients following research into the key nutritional elements known to benefit hair health. These include biotin, selenium and zinc for the maintenance of normal healthy hair growth, as well as vitamin D3, and many other premium components. As yet, there is no clear evidence that boosting vitamin D3 will either reduce the likelihood of initiating a hair loss condition (or autoimmune disorder) or alleviating existing symptoms, but the link does appear to be there, and doctors around the world are keen to explore it. Whilst it is true that both forms of vitamin D are essential for health and well-being, the new research shows that our bodies absorb and use vitamin D3 better. And as vitamin D3 is more effective at treating diseases, it seems likely that this will be the form of the vitamin most beneficial to hair health. With frustrating familiarity, the new information from the University of Surrey is yet another reminder of how easy it can be for somebody to present with hair loss of one type or another. Good health, good diet, sensible lifestyle choices and, irrefutably, good luck in terms of genetics can all play a small or significant role in keeping hair loss at bay.